We had planned to visit Peckham Rye parkrun this week but Other Dan dropped me a message on Saturday morning to say that his foot still wasn’t 100% so I was on my own again. I wasn’t going to visit a Lon-done parkrun by myself so looked around the outside of the M25 for a venue that I could drive to within 60 minutes, trying to pick one on the edge so it wouldn’t put a significant impact on me and Other Dan reaching 100 different parkruns. I plumped for Milton Keynes parkrun and plotted out my route and parking, using the information on their website. The drive was uneventful although it took me on the route I now drive along to work during the week, which isn’t necessarily a good thing on a Saturday – too much like I was going to work. I plumped for parking at the Newlands carpark, which is situated near to the café for post-parkrun drinks. However, I thought it was odd that the car park was empty for an event that attracts over 400 runners on a consistent basis. The warm-up jog to the start area took me past the second car park and that was fairly empty as well. Hmmmmmmm. What was going on? I arrived at the start/finish area and found out that all the regulars park at the Gulliver’s Land Theme Park, which is right next to the parkrun start & finish. Their web site suggests that parking is free here rather than the official paid car parks that serve the Willen Lake area. 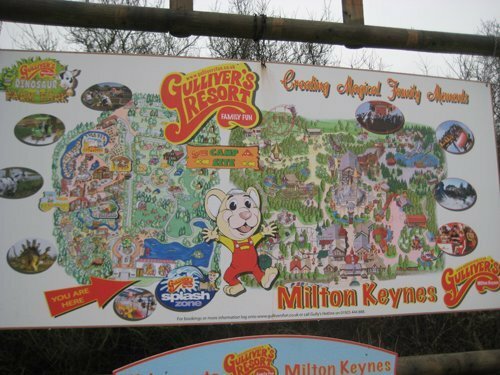 I can understand why the parkrun page doesn’t mention the Gulliver’s Land car park since the land owners don’t want their parking taken up by non-visitors but if you’re heading to Milton Keynes parkrun then be aware that this is also an option. The course is a single all tarmac lap that starts in the parkland, includes a small hill where the path zigzags up, and then finishes with a large loop of the lake until you’re back to the start area and through to the finish funnel that’s located slightly further up the park. I’m not in the best shape at the moment so I found the run tough going thanks to the rain for the first section and then the combined wind & rain sweeping across the lake. In the end I was thankful for the sight of the finish funnel and had no energy to challenge the runners overtaking me on the finishing straight. I slunk back to my car in the drizzle and headed back due to family commitments at home. I’ve marked this one down as a venue to visit again when Other Dan is back running, preferably in the summer on a non-windy day so I can enjoy the run around the lake.